The busiest time of the year has come and gone. This gives us, the Knights, some time to reflect back on the last three quarters, and to get started on assessments and reporting while also planning ahead for 2019. 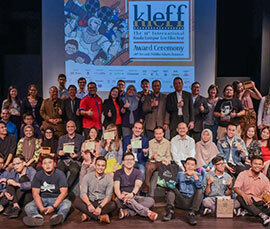 If you were part of the recent KLEFF, I really hoped you had a great time enjoying the films we presented, the range of activities and programs delivered to the public as well as the kind of connection and networking gained. I know I had a wonderful time connecting people, and best of all, moving ahead in charting more positive collaborations to facilitate sustainability initiatives in the country. This newsletter will bring you some of our recent updates and activities, and we hope that it would bring a strong sense of hope, passion and volunteerism spirit to encourage you to be part of our army of change. We may be a small NGO paving the way for the public to start living sustainability, hence why the power of YOU is critical in ensuring our effort bears the right results and effort for the people and this beautiful planet. 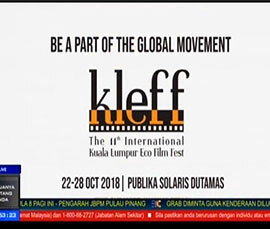 In its eleventh year, the International Kuala Lumpur Eco Film Festival (KLEFF) 2018 kick-started from 22nd until 28th October 2018 at Publika Solaris Dutamas, Kuala Lumpur. Partnering with more than 30 partners, the festival was built on a number of components, providing another week of wholesome eco experience to its visitors. 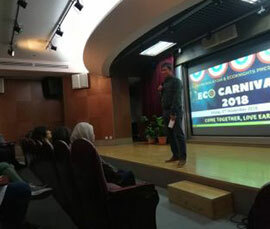 Here’s a report on the South East Asia’s longest-going eco film festival. You can view the photos of the festival in the Facebook page. On the 5th of September, EcoKnights organized a log-boom clean up at the Kerayong River with 40 HSBC volunteers. Up to 172 kg of waste was collected just within 2 hours. On the 15th of September, 220 HSBC volunteers joined the first ever EcoKnights beach clean-up at Bagan Lalang Beach. 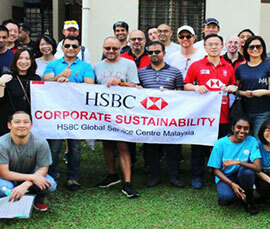 With HSBC’s help and enthusiasm, 324kg of garbage was collected. Read more here. 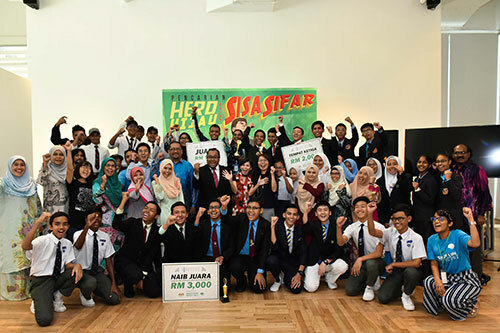 On the 2nd of November 2018, Bursa Malaysia Berhad partnered together with EcoKnights to organize Bursa Eco Carnival Day 2018 for the second year running. Bursa Malaysia invested in their staff by raising awareness and encourage participation for a more sustainable and environmentally friendly lifestyle. This is aligned together with their Bursa Corporate Responsibility Framework which encourages their employees to give back and care for the environment. Check out the activities on during the carnival, joined by the supportive staffs! VANKE HARDWARE INSTALLATION: KNIGHTS GET NEW GADGETS! Thanks to Vanke Holdings (M) Sdn Bhd, new computers and a printer were acquired for EcoKnights office in support of the organizational development. In conjunction with the installation, a team of Vanke staff visited the EcoKnights office. Other than the hardware and gadget installation, representatives from Vanke had a casual talk session with EcoKnights president Yasmin Rasyid to know more about EcoKnights’ works and roles. They also had a tour in the office and at the nearby community edible garden. 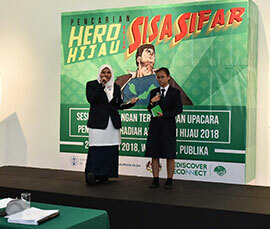 The collaborative Green Outreach Programme partnership between Starbucks Malaysia and EcoKnights has successfully yielded even more engagements. 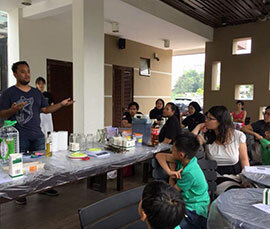 Two DIY Soap-making Workshops have been conducted at Starbucks Kota Kemuning Drive-Thru and the Plaza Mont Kiara branches. These workshops showed the public how they can upcycle their supply of used cooking oil that usually ends up in drains and rivers after usage. 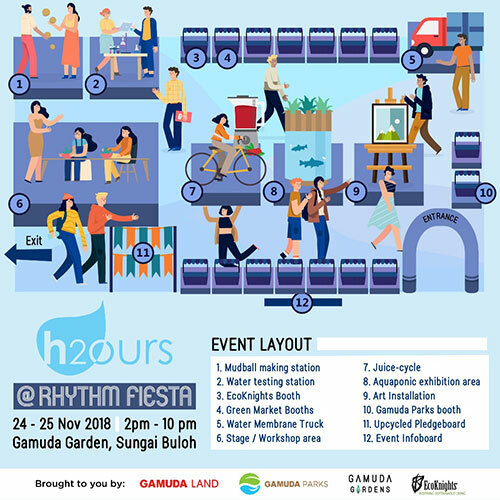 In collaboration with Gamuda Land and its event Rhythm Fiesta, EcoKnights will be holding the H2Ours at Gamuda Garden this 24th & 25th of November (Saturday & Sunday) from 2pm till 10pm. The water-themed event aims to spread awareness about water conservation through interactive activities such as urban aquaponics other water-related, vendor exhibition, workshops, and lots of fun! 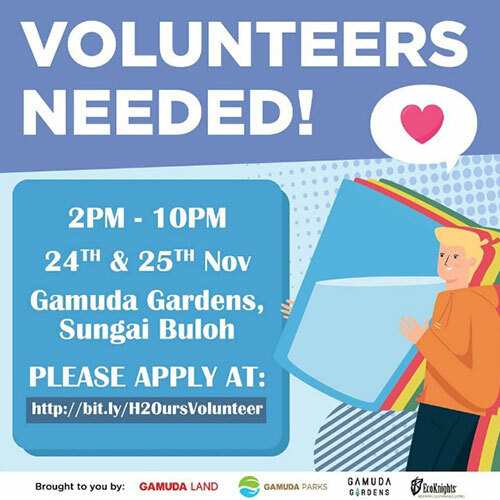 The EcoKnights team is also calling out for volunteers who are looking for extra experience in the H2Ours. In conjunction with World River’s Day, another log-boom clean up was conducted at the Gombak River on the 19th of September, this time with the involvement of the Department of Irrigation and Drainage (DID) and 18 media and social influencers. 87.8 kg of river trash was collected and segregated within a 40-minute session. There was laughter all around as participants donned some rubber boots and got their hands dirty cleaning our rivers. Among the participants were Syed Azmi, Davina Goh and Syaq Koyok. 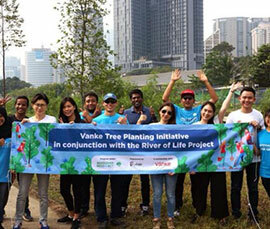 As one of the efforts under the River of Life Public Outreach Programme the EcoKnights, 20 fruit trees were planted along the Bunus River with Vanke Holdings (M) Sdn Bhd. Eager to know what the fruit trees are? Click the link here. 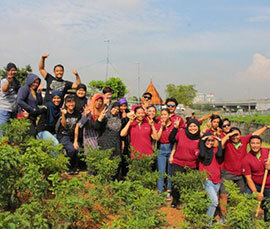 In conjunction with the global World Rivers Day celebration last week, EcoKnights, together with other partners and sponsors, organized the inaugural Bunus Fun Walk for River 2018. The walk saw about 500 participants walking as far as 3.5 km around the Boyan Retention Pond, where Bunus River flows into Kampung Baru. Besides the walk, multiple sseries of activities were carried out that day. Deputy Minister of the Ministry of Federal Territories, Dr. Shahruddin Mohd. Salleh showed support by launching the event as well as participating in the walk. Read more about how Bunus Fun Walk can educate the public on river conservation. Maintenance for the Taman Ikan Emas Community Edible Garden was carried out on 8th of September to improve the facilities there. The activity received supports from the local residences and Starbucks volunteers. 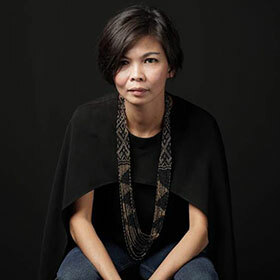 Co-founder of EcoKnights Pn. Mariam also taught on how to convert orange skins into useful eco-enzyme. The maintenance ended with the residents happily harvesting the results of their hard work: fresh vegetables. Check out the harvest at Taman Ikan Emas Community Edible Garden here. The finalists have gone through several stages from proposal pitch-in, workshop, monthly reporting to site visit evaluation before reaching the finale, guided by their teachers and mentors from EcoKnights, iCycle Malaysia and Green Yards. EcoKnights would like to congratulate the winning schools as well as the finalists for coming this far in the effort of a better waste management system for a cleaner river. 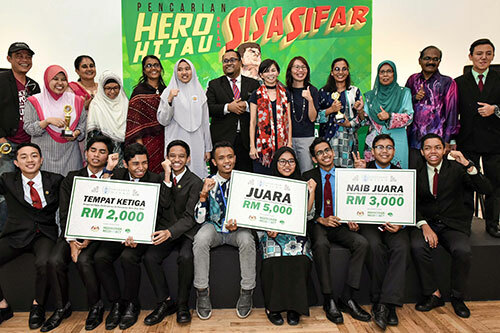 The photos of the Anugerah Hijau competition’s finale can be found here. We all know straws are harmful to the environment despite the convenience for consumers. How can we make sure straws aren't just being banned in our new policy, but also becoming part of the lifestyles of Malaysians? 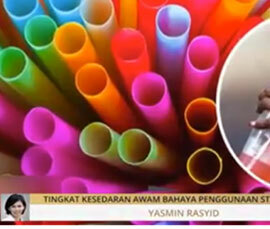 Check out this television interview with Yasmin Rasyid, President of EcoKnights, on how schools, parents, and local councils can play a role in finally saying no to straws, once and for all. 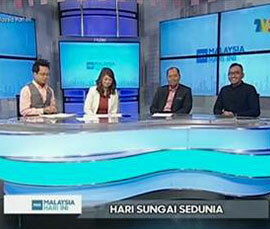 Catch the interview of Program Director of EcoKnights, Fadly Bakhtiar was in a TV interview together with Tuan Haji Md. Khairi, Director of River Basin Management from the Department of Irrigation and Drainage Malaysia at TV3’s Malaysia Hari Ini program discussing on World River’s Day. The Bunus Fun Walk that was held in conjunction with World Rivers Day attracted the attention of a lot of people. Prior to the event, EcoKnights president Yasmin Rasyid, who is also the chairperson of Sungai Bunus Action Group, was invited by BFM to their studio to share about the efforts that has gone into the rehabilitation of our rivers. Let’s listen to the radio interview and understand the government’s efforts better. With Bunus Fun Walk for River achieving such a great engagement, the event has received great media coverage in different languages. 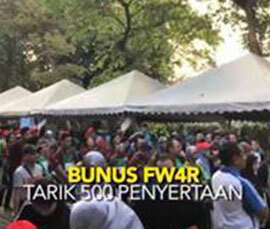 Here, Bernama has published media articles about Bunus Fun Walk 2018 in both Bahasa Malaysia and English. 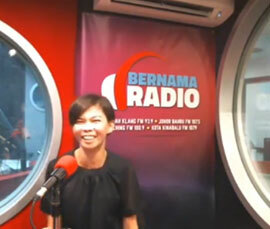 EcoKnights President Yasmin Rasyid was at Bernama Radio sharing about the Bunus Fun Walk which was held in conjunction with the World Rivers Day. Let’s find out why Bunus River is so important until attracting massive conservation efforts through the interview. Catch EcoKnights’ President Yasmin Rasyid and Program Director Fadly Bakhtiar on interviews at BFM, Malay Mail, and Bernama Today to explain what the KLEFF was about and the messages it holds. Recently two amazing interns served their internship with us and what can we say, they are as always, superb. Let’s have a read on what they have to say about their internship experience with us. 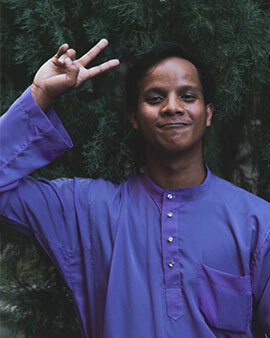 Hi there, I’m Ali Zulhazim from USM Penang and I was an intern in EcoKnights from September till October. Although it was only for two months, my days in EcoKnights were awesome. I have no regret joining the EcoKnights team as I experienced a lot of new things, made new good friends and worked in a very conducive working environment. Being in EcoKnights is not just about making sure our jobs are done. It is beyond that. EcoKnights is a family. I was always being pushed to my limit, to do things that I am not used to. However, I did not doing this alone. My colleagues were there when I needed them. I was challenged to improve myself and they were there to guide me. And yeah, what does not kill you will make you stronger. At the end day of my internship, I knew I have improved my self-development a lot. I have learned so many things that will be useful for me in my working life. Thank you EcoKnights for being a good teacher, family and friends to me. I came into EcoKnights as part of my 3-month internship for my degree course. It’s my first time experiencing work at a residential office and the best thing is we don’t need to wear formal office attire during working period unless we are required to! I would say that my short time in EcoKnights has played a big part for my growth. I was assigned to intern under Emirul Redzuan (in short, I call him ‘Em’) and work together in the River of Life (ROL) project. It was a wonderful experience for me as I obtained more opportunities to engage with local communities, listen to their needs and help them solve their problems. Other than communities, I was also given the chance to attend meetings with DBKL and partners such as Starbucks Malaysia and Vanke Holdings in which I learnt the importance of KP1 and objectives for every project. Through my involvement in these projects, my communication skill has improved by communicating with people from different levels and backgrounds. Moreover, I also learnt to be a more organized and disciplined person. By helping Em to organize a few activities such as garden maintenance, tree planting and river clean-up activities, I have learned the importance of logistic management, task delegation as well as the communication within the EcoKnights team. This improved my project management skills a lot as we were faced with limited resources, especially manpower and short period of time to complete a project. I’m so glad to go through these challenges as it pushed me to another level in work management. Thank you Em for always pushing me to figure out solutions for problems instead of waiting for help. Thank you Fati for always being by my side and showing that positive attitude can change the impossible into something possible. This definitely helped me to improve my problem solving skills which I think is an important skill that needs to be mastered by every individual. Not forgetting the fun times that we had during the Anugerah Hijau and Knight of Nature camps! I met new friends, went through games and challenges together and the most important is we got closer to our mother nature. This is where I experienced my first camp fire and first walk in the mangrove. It’s hard to really say goodbye to EcoKnights once you have adapt to the office culture. Every Knight in the office is so caring and is always on standby to support each other. We may have argument sometimes but this actually helped us to grow closer and to know each other better. 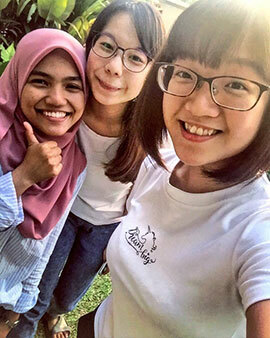 Like what Mok has said, EcoKnights not just only trained interns, but also individuals. In EcoKnights, you are always given unlimited space to grow. Once again thank you EcoKnights for giving me the chance to apply my internship here where it turned out to be a perfect experience for me. Thank you to every Knight in the office who were with me and made my days at EcoKnights even better. If you do not want to receive further information from us, please . You will be immediately removed from the list.